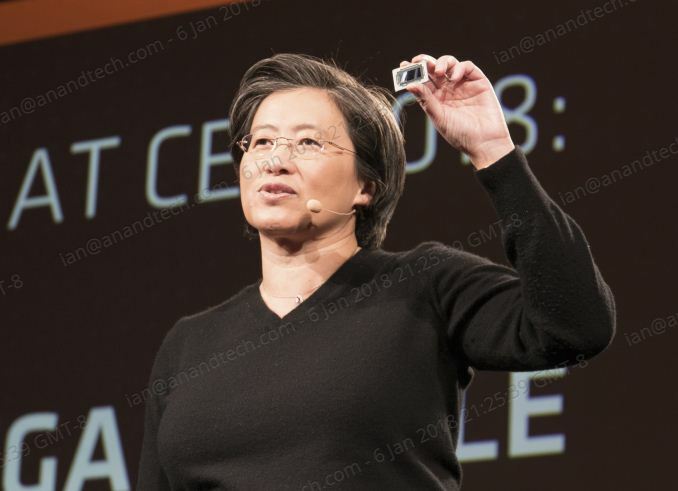 We interviewed AMD's Dr. Lisa Su at CES! You can read the interview here! To mark the start of the annual CES trade show, AMD invited the press in early to sample the latest technologies coming to its portfolio in 2018. What was quite surprising is how much AMD exposed about their plans for 2018, detailing several product lines and launch times well in advance, with some blanks to be filled in later. The highlights include Ryzen APUs, the second generation of Ryzen built on 12nm using the ‘Zen+’ microarchitecture, and proliferating Vega into as many segments as possible, including a new Vega Mobile GPU range, as well as Vega coming to GlobalFoundries’ 7nm process. To say AMD had a busy 2017 was an understatement. With 10 product family launches across CPU and GPU, it was a brave journalist that covered them all in detail. 2017 was so busy as many projects naturally culminated to that time frame, and as a result, last year was very prolific for AMD news, the AMD brand, and AMD products. 2018, by contrast, will be quieter for the frequency of noise, although as described by CTO Mark Papermaster, 2018 will be a year where AMD ramps up products and takes advantage of the low-hanging fruit for performance and product segment. CEO Dr Lisa Su stated that while AMD is a company that sometimes takes more risk than others, AMD’s goal for 2018 is to keep the focus on high-performance computing, offer more performance at every price point, and expanding customer momentum. It will be interesting to see it all play out in practice. With this in mind, it was surprising to see AMD discuss a lot of its 2018 roadmap in the Tech Day setting. While most of the roadmap could have been predicted by those of us embedded in this industry, it was good to see AMD volunteering a lot of information. This can be a bit of a double-edged sword, if a competitor knows what you have planned, but AMD is confident that, to quote Dr Su again, ‘Ryzen was just the start’. This is the CPU/APU product line, and along with new product lines, there are also some new refreshes. Second Generation Ryzen Desktop Processors: April. For most of these, we were given a good amount of information, which we will go into in the following pages. It is interesting to know that the second generation parts will be built on GlobalFoundries 12nm ‘12LP’ process, which we were told will offer 10%+ better performance per watt than the 14nm ‘14LPP’ process. We were also told that the new 12LP process focuses on features to optimize performance per watt, and that the new 12LP Ryzen desktop processors are already in the hands of AMD’s partners. On the graphics side, AMD’s roadmap was a little more conservative. With the launch of Vega 56 and Vega 64 in the middle of 2017, as well as the Radeon Instinct line, AMD’s focus will be on Radeon RX Vega Mobile discrete GPUs. These mobile-class discrete GPUs are optimized for z-height, coming in at 1.7mm, but will also use HBM2 (high bandwidth memory) on an interposer, indicating an update on AMD’s prowess on interposer technology that previously has been somewhat bulky. The purpose here for Radeon RX Vega Mobile is to move discrete graphics into mobile and small form factor systems that are currently occupied by mid-range NVIDIA graphics. HBM2 is still a premium product, so we expect that when they come to market in Q2, they will aim for thin and light systems that also want to support VR-like technologies. Also on the list is perhaps the surprise announcement of the day: AMD will be bringing Vega to 7nm, with customer sampling expected to start in 2018. This ultimately means that Vega on 7nm will hit the shelves in 2019, but there is a twist to the tale. The first products off the line will be solely for the Radeon Instinct family and machine learning. Users who want 7nm desktop-class products will have to wait a little longer, but it does give an indication of how GlobalFoundries 7nm process is coming along. Since the announcement of AMD’s Zen core, and the subsequent detailing of the Zen microarchitecture in August 2016, the focus has ultimately been about long-term stability about AMD as a company through building the product stack after a recessive period during the Bulldozer years. AMD has set several goals out to 2020, to cover multiple generations of CPU and GPU products as well as a march on semiconductor process. The latest outlook is pretty much similar to what we have seen before. For the x86 processor line, AMD delivered Zen based on 14nm in 2017. This covered Ryzen, Threadripper, Ryzen Pro, EPYC, and Ryzen Mobile. A revision to Zen, known as Zen+, is built on 12nm and will form the basis for AMD’s 2018 targets as listed above, including second-generation Ryzen on desktops, second-generation Threadripper for high-performance, and second generation Ryzen Pro for commercial applications. As Zen+ is a revision, it is unclear if Ryzen Mobile or EPYC will also be updated – if the roadmaps above are complete, then not in 2018. Back at the launch of EPYC, the second generation EPYC (codenamed Rome) was listed as Zen 2 on 7nm. After Zen+ will come Zen 2, a major microarchitectural update over Zen/Zen+. While the goal of minor revisions in Zen+ is to find low hanging fruit to increase performance, Zen 2 will enable AMD to change certain paradigm concepts in the core, such as decode width, instruction support, cache behavior, and power implementations. AMD confirmed that the Zen 2 design is already complete, much to the surprise of the people in attendance. This typically means that the floorplan is fundamentally ready to go to, although minor adjustments will still need to be made as the manufacturing process is improved, optimized, and potential silicon bugs are found. In the 2018 announcements, AMD is not announcing anything Zen 2 related, so it firmly puts Zen 2 into the 2019 bucket. This also gives some indication of when GlobalFoundries expects to implement 7nm at scale. Finally, AMD expects to implement Zen 3 by 2020. Just to be clear, if AMD did launch in Q4 of 2020 that would still be within AMD’s target window. Zen 3 will be built on an improved 7nm process called 7nm+. It is our understanding that the 12nm process is essentially a 14+ process for GloFo, so the 7+ process might be renamed at a later date perhaps. But if the Zen 2 design is complete, I would expect more of AMD’s microarchitectural engineers to be on the Zen 3 design now. 2017 saw the launch of Vega inside Radeon Instinct, Vega 64 and Vega 56, integrated into Ryzen Mobile, and a product to be sold by Intel with a Core CPU plus Vega GPU product. The beginning of 2018 will see Vega push into more APUs in mobile on the desktop, and into the discrete GPU mobile space, however no separate mainstream graphics products seem to be on the horizon. Discrete Vega chips seem to be paired only with HBM2, while combined APUs are happy with DRAM: this might be how AMD is preparing to approach its graphics stack in the future. AMD’s GPU line will be bypassing the 12nm process used by the Zen+ CPUs, and moving straight to 7nm with Vega. This is a distinct change from previous AMD roadmaps, which had confirmed that we would be seeing Vega on a '14nm+' process node, or Vega on the 12nm process. It would appear that the '12nm' node is the new name for 14+, but AMD's GPU product line will now be bypassing this completely, despite being 'confirmed' before. As mentioned above, AMD plans to start sampling a machine learning focused version of Vega on 7nm much later in 2018, where ‘sampling’ in this case means pre-testing to select partners. This will likely lead to a Radeon Instinct product, initially perhaps with a small die size, being made available in early 2019. The big product on 7nm, however, will be AMD’s Navi GPU architecture. AMD did not go into specific details, but we suspect that Navi will be permeating through most of AMD’s discrete product line portfolio, as well as being implemented into APUs with Zen 2 processor cores. Given the timeframe here, Navi is certainly a 2019 product, although it might be debatable if that means early or late 2019. Before the end of 2020, AMD plans to implement its next-generation ‘post-Navi’ GPU architecture, using GlobalFoundries’ 7nm+ process. This would align with Zen 3 on the CPU side. If we took the worst case scenario that this Next-Gen design ends up in December 2020, then this gives a slight indication of how AMD would release Navi. Navi would have to be far enough away from the Next-Gen part so the Navi design could be spread across the ecosystem for AMD to reap the benefits, but also at a point where the 7nm Vega hardware would have helped optimize the 7nm process prior to Navi ramping up to full production. >Radeon 530 discrete GPU, which has 384 compute units based on AMD’s older GCN 1.0 architecture. "Also included at AMD’s event were a number of side announcements that we will also go into. This includes (but is not limited to): Custom Radeon Vega Designs"